* Submitted quirk upstream for Lenovo S205 (this one has a Conexant chip, for which we already have a solution). * SL410 seems to be a different problem judging from the latest comment in that bug. * In discussion with upstream about the Realtek ones. Thank you for your patience. The Conexant ones are trivial to fix now, but we're not sure what to do with the Realtek ones yet. 4) now try recording normally from Internal mic. Please report back whether it works or not. Thanks! In mine too, added a more detailed output in the bug #1004819 , thanks for your work! Seems a sorta work, Lenovo S205. The internal microphone is now working in Skype, but the output volume control with pavucontrol doesn't work any more, the volume is always at its maximum level, independently from slider position, unless controlled with an application's function. Rebooting didn't help. Maybe, I'm just doing something wrong. 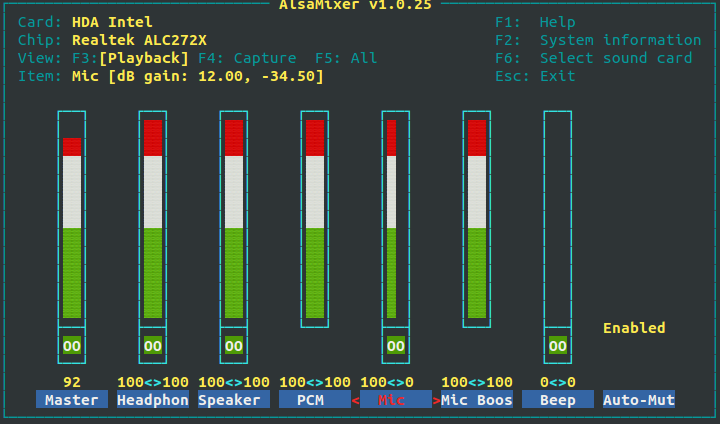 Also, could you give alsa-info output with this configuration? @Renzo, sorry, it is probably correct in alsamixer. 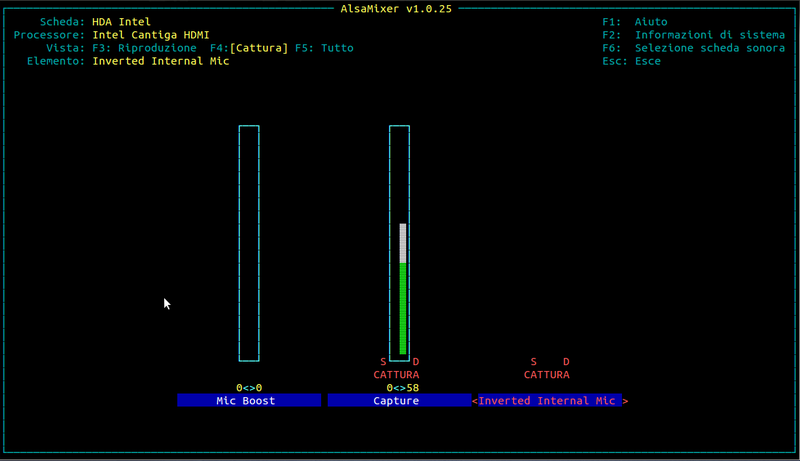 Just use the "space" key to disable recording of the Inverted Internal Mic in alsamixer. David, you was right, I used the space key to disable the Inverted Internal Mic and now the microphone is working well in all applications. Thank you very much for your suggestions! The package alsa-hda-dkms_0.1_all.deb SOLVED my problem. Possibly this is only a bug in alsamixer. Does the alsa-hda-dkms_0.1_all.deb work in Ubuntu 11.10? @diwic - can you please take a look if this is the case and add that Laptop? I have a Lenovo G470, and followed the steps to certify that the notebook does not have an inverted microphone. It turns out it doesn't. Nevertheless, have installed alsa-hda-dkms_0.1_all.deb to give it a try. The microphone started working OK on Skype after that, but the output sound of the speakers were suddenly really noisy and polluted (only on Skype). I decided to uninstall the package, and the microphone obviously is not working anymore. I can provide more information about the machine if needed. I am also following bug 1033011. This also effects Acer Aspire ZG5 on ubuntu 12.04, 12.10 and 13.04. > Just to let you know my findings since two years . There is a closed source kernel (in Linpus for Acer Aspire One) driver to handle this kind of small array microphone from Fortemedia (here on Acer Ferrari One 200). There are in fact 4 channels ie 2 stereo signals (force channels_max to 4 in hda_intel and patch_realtek). Acer Aspire Timeline X 4830TG affected in 12.04, 12.10 & 13.04. Thanks for the workaround. Did someone finally manage to solve it on Acer eM350? Please disregard comment #48. This was wrongly reported as a bug by me. My apologies. As regards comment #49: this (http://forums.linuxmint.com/viewtopic.php?f=49&t=177730) is what happened and how I solve it. Nothing to do with an inverted microphone. Any chance to fix inverted internal microphone on Lenovo B50-70 /comment #47/. Can you add a quirk, please. It seems that Lenovo Yoga 300 also has the same problem. I reported Bug #1713784. @David Henningsson (diwic): we haven't heard from you on this bug in over 3-years. If you are still tracking this issue here and would like to keep doing so, please change the 'Status' of this bug to 'Confirmed'. Thanks!